Sam wants to go out but it's pouring with rain, so he and Grandpa decide to stay inside until the rain stops. Sam drinks hot chocolate and reads his books and dreams of adventures while Grandpa gets on with his important paperwork. Grandpa seems to have a VERY important letter to write. Then that very important letter has to be posted, despite the rain and floods. As they finally go outside, Sam and Grandpa have a magical adventure. 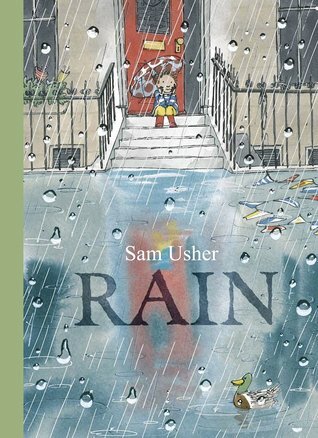 A young boy wakes up to pouring rain, but unlike many people, he's thrilled as he thinks of all the adventures he can have in the rain. But his grandfather is not so eager to go out in the rain so he asks Sam to wait and wait and wait. After each time the grandfather asks Sam to wait the illustrator presents a full two-page spread. And the reader gets to watch the water level rise in each of these two-page spreads. When Sam and his grandfather do finally go outside I admit I was a bit surprised at the result, especially as it's apparent that the street is flooded. But needless to say, Sam gets his adventure after all. Usher has created a wonderful ode to the wonders of a rain-drenched world. 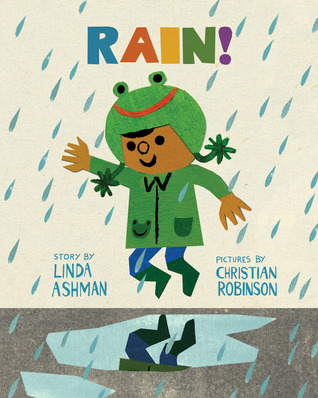 With a handful of words and some adorable illustrations, Ashman and Robinson have created a story about finding joy in the little things and sharing with those around you. The story follows a grumpy old man who gets up and frowns his way out of the building and down the street to a cafe. At the same time a young boy and his mother are also getting up and heading to that same cafe, where they meet the grumpy old man. The boy finds joy jumping in the puddles and pretending to be a frog. When they meet the grumpy old man grouches at the boy's offering of a cookie and a ribbit which leaves the boy grouchy, but only for a moment. When the boy realizes the man left his hat behind, he takes it upon himself to return it. Before he hands back the hat though, he puts it on and frowns, demonstrating for the man what he looks like to those around him. The old man takes back his hat and then surprises the boy by pointing to his frog hat and trying it on. This time when the boy offers him the cookie and a ribbit, it is gratefully accepted. Robinson's illustrations are adorable as usual, as well as bright and colorful making a nice compliment to the spare text. What older child hasn’t felt left out when a new baby arrives? Philip certainly does. His new sister Phoebe can barely say “ga-ga” yet everyone goes ga-ga over her. Philip, despite his superhero cape, feels alone. Finally, he devises a plan. Using a bit of magic and a lot of determination, he sneaks into her bedroom at night with the intention of changing her into something more manageable, more exciting, more fun. Except things don’t go exactly as planned. 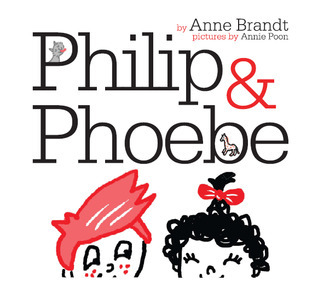 Philip & Phoebe is a cute enough story, but it felt rather uneven to me. Like many stories involving siblings, Philip resents the way everyone coos over his little sister and scolds him for similar behavior. So one night, he tiptoes into Phoebe's room and wishes she were a horse, then an ice cream cone, and finally a red fire truck. Naturally none of these wishes works out the way Philip wants them to and he ends up wishing Phoebe back. Unfortunately, this is not a particularly unusual story line, many picture books about siblings involve wishes and annoying little brothers or sisters, at the same time though it's a story line that many children can relate to easily. There really is no reason given for Philip's wishes coming true, although there is a falling star in one illustration. The illustrations are pretty cute and the one color works well in terms of appeal and contrast. The book felt a little crowded though with the small size of the book, which also makes it hard to share with a large group. The part where Philip turns Phoebe into an ice cream cone and licks her doesn't work for me very well, he licks her after all, plus the ice cream cone doesn't melt or get any smaller. Magic doesn't always have to have rules for how it works in this sort of story though, I just didn't particularly care for the idea of turning a person into something to be eaten. Also, the ending wasn't as clear cut as I would have liked it to be, Philip turns Phoebe back, not because he likes her, but simply because his wishes didn't work out. Philip doesn't seem to appreciate Phoebe any more than he did before. In addition, the story starts in present tense and shifts to past tense which is a bit jarring. I also didn't feel a lot of sympathy for Philip after seeing him tormenting a cat and pouting in his tree house. 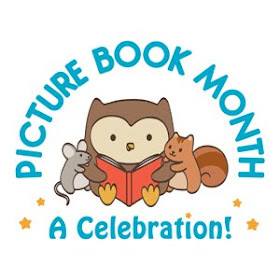 A cute book, but there are better ones out there.